One of the latest commenters I've come across is a fine fellow with the wit for words, Mr. J. Cosmo Newbery. He and I traded blurbs about an eatery that is known around parts of Texas as Freebirds. It is a burrito shop that is just wonderful. They offer great food, great prices and a great environment. They have locations in Houston, Austin, Dallas and Fort Worth (and maybe more); but originated in College Station (home of Texas A&M University). He could not understand my deep devotion to their wares, as I stated that I would actually die for one (I wouldn't, but don't tell them that). So, for Mr. Newbery; I offer my own creation attesting to their grandeur. I hope it pleases. 'tis my palate you make sing. the double or the monster, gawl!! those would force me to one knee. mash and twist it or tear it apart. my own creation, very neat. for yours alone I would die. My daughter and son have been grounded recently, and justifiably so. They each received horrendously bad grades on their last progress report. So they have been without computer privileges for a few weeks. Now they are free and what does she do?? She comes straight to my site and reads the wicked little ode I wrote about her mother for the new boy toy. She leaves a nice little sarcastic message in the comments and then drops her own submission for the last Caption Contest (incredibly late but quite good I may say). She even used the word contortionist, which is a mighty fine word. She continues to impress me at every turn. She is wonderful. Vana Lea, I am sorry for upsetting you with my written gift to your step-father. Should I mail it to him?? I think not. However, there are quite a few lady bloggers out there that are going through the similar situation I am. I have seen how they vent and get upset with their once significant others, as I do and am. So I am curious as to their take on this. I am taking suggestions and comments, no offense will be taken so spill your true feelings about any part of the whole spitsville mess. And with that in mind, I offer up another of my minds twisted little word-works. I hope you enjoy it or that it touches or helps anyone else in any way. In his time before he passed. Until the time we breathe our last. and preparing for bad weather. are bound to bring him shame. Are traits I wish too hide. That gave him no gray hair. And tear me down so low. And don’t have to write or live this same rhyme. Speaking of taming wild inner beasts, we travel to Dallas this weekend for one of our cup rugby matches. I fully intend to vent my inner anger on some poor unsuspecting fool from the DFW Metroplex. It is my anger management program, because I feel so much better (mentally not physically) after grinding some other person's head into the mud and having the same done to me. In reality, it is as close to being in a warrior's battle in this day and age as most men can get. It allows me to test my physicality and mental resolve against others in a semi-hostile environment. Because of my moments on the rugby field, I am fully confidant that I could chase down , catch, kill and bury any criminal that would make the mistake of targeting my family (and that is if I buried him instead of cooking him and serving him to the crack addicts downtown). Gone are most the reasons and opportunities for the young men today to be the hunters, warriors and protectors that God intended us to be. I relish my time on the pitch as I know my advancing age is bringing those days to a quick end. 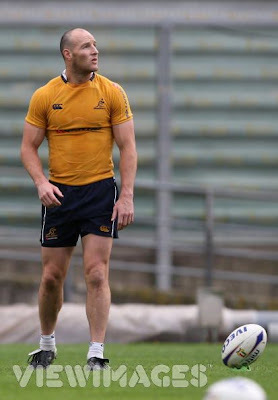 But until I can play no more, I will strive to be like the most awe-inspiring rugby warrior I know, Stirling Mortlock. Enjoy the picture ladies.